Nothing beats the smell and feel of a heavy summer rain. Well, okay, maybe only the epic lightning that sometimes follows it. If you want to capture the photos of that nature’s light show, Hank Schyma has some pro tips to share with you. In this video, he’ll give you some tips and tricks how to make amazing photos and videos of lightning and make it as awe-inspiring in your work as it is in real life. Or maybe even more. If you’re into storm chasing and fantastic timelapse videos, then you’ve probably heard of Mike Olbinski. He has recently published his latest video, and just like before: it’s mind-blowing. You can see a tornado forming right before your eyes, and Mike managed to capture its entire lifecycle that will leave you in awe. One of the windiest nights I’ve ever taken pictures turned into perhaps the single most rewarding — and frightening — landscape photography experience of my life. I was on the Mesquite Sand Dunes in Death Valley, a place I had visited twice in the past, though under much tamer conditions. This night, the gusts of wind were far greater than I had seen before, and they kicked up a layer of sand that made for amazing sunset photos. But as the day came to a close, it was clear I had entered uncharted waters. Thunderstorms are awe-inspiring, whether you watch them live, in photos or in videos. But videographer and photographer Dustin Farrell has made a slow-motion video that makes thunderstorm more enchanting than ever. Dustin chased storms during the summer of 2017 and collected his best shots in a short film titled Transient. It shows lightning in slow motion and turns a sudden flash of light into a hypnotizing electrical drawing in the sky. 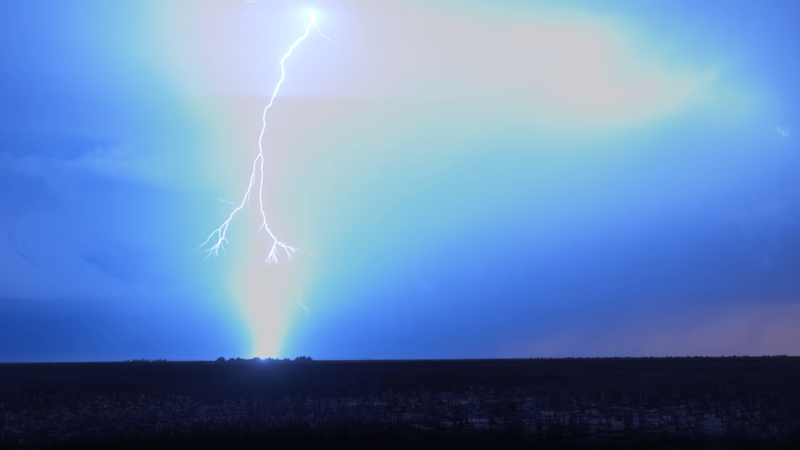 If you enjoy watching the lightning, you’ll enjoy it even more in slow motion. Shooting storms is an incredible experience, and many of us are attracted to it. Daniel Modøl from Norway was filming a heavy thunderstorm from his deck – when suddenly a lightning struck incredibly near him. It destroyed a part of his backyard and deck, missing the man for only a couple of meters. You may know Mike Olbinski by his stunning work in creating storm timelapse. He recently presented his latest work, appropriately titled Pursuit. This time, nature wasn’t on his side. It was difficult to catch the storms and shoot them for the film, despite all the effort. So he traveled 28,000 miles across the USA, pursuing the most spectacular and awe-inspiring storms, and not giving up. And he did it – he created another fantastic timelapse video that shows the overwhelming power of nature. I sometimes think how awesome it must be for pilots if they love photography. And an Ecuador-based pilot and photographer Santiago Borja Lopez proves me right. He captures night skies from his Boeing 767, and sometimes, these images involve lightning bolts and incredible storms. The sky from an airplane is magnificent on its own, but if you add lightning bolts above the clouds to that picture – you’ll get something completely astounding. Nobody can throw a spectacular light show like nature can. Timelapse photographer Ron Risman is well aware of this, so he chased a storm to create a magnificent timelapse of thunderstorm raging over a field in Kansas. He shot it in 4K and combined it with epic music (reminds me of music from Warcraft). As a result, he got spectacular thunderstorms striking at the beat of the song. It’s amazing for both watching and listening. Take your earphones, play the video, and enjoy!